In 2012, the city of Detroit started exploring ideas on what to do with its old fire department headquarters. Built in 1929, the five-story neoclassical building boasted serious architectural gravitas (the original built in the 1840s, ironically, had burned down) and received a lot of attention. 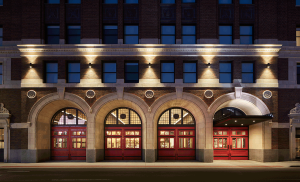 Ultimately, the winning bid went to Aparium Hotel Group with Chicago-based Simeone Deary Design Group and local firm McIntosh Poris Associates to create the Foundation Hotel.